Here at Dogfish Head, we’re beer geeks with a music problem. So it’s a natural fit to team up with the fine folks of Record Store Day as the Official Beer! Celebrating the unique culture of record stores and the special role they play in their communities, Record Store Day shares our same commitment and independent spirit. Now in our fourth year as the Official Beer of Record Store Day, we’re comin’ atcha with a whole new bag of tricks! We’re bringing independent beer and independent music together with the release of a first-of-its-kind beer and vinyl collaboration with American rock icons, The Flaming Lips! Dropping on Record Store Day (Saturday, April 21) The Flaming Lips will release a limited edition 7” called ‘The Story of Yum Yum and Dragon,’ featuring two original songs inspired by our latest release, Dragons & YumYums - a lip smackingly tart pale ale. 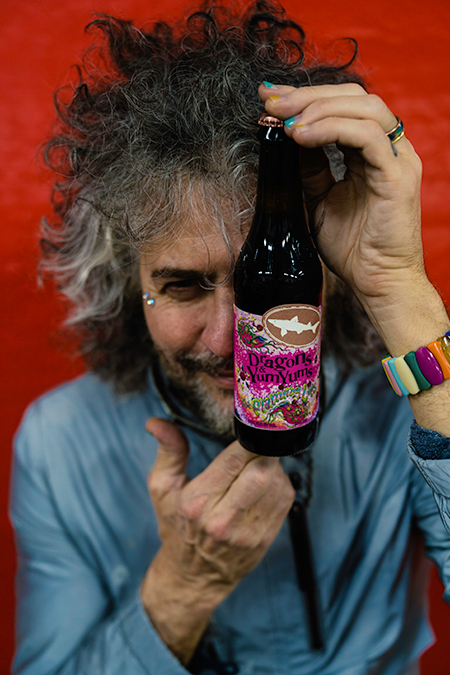 Composed by Flaming Lips front man Wayne Coyne, the lyrics pay tribute to the colorful array of off-centered ingredients in the beer. 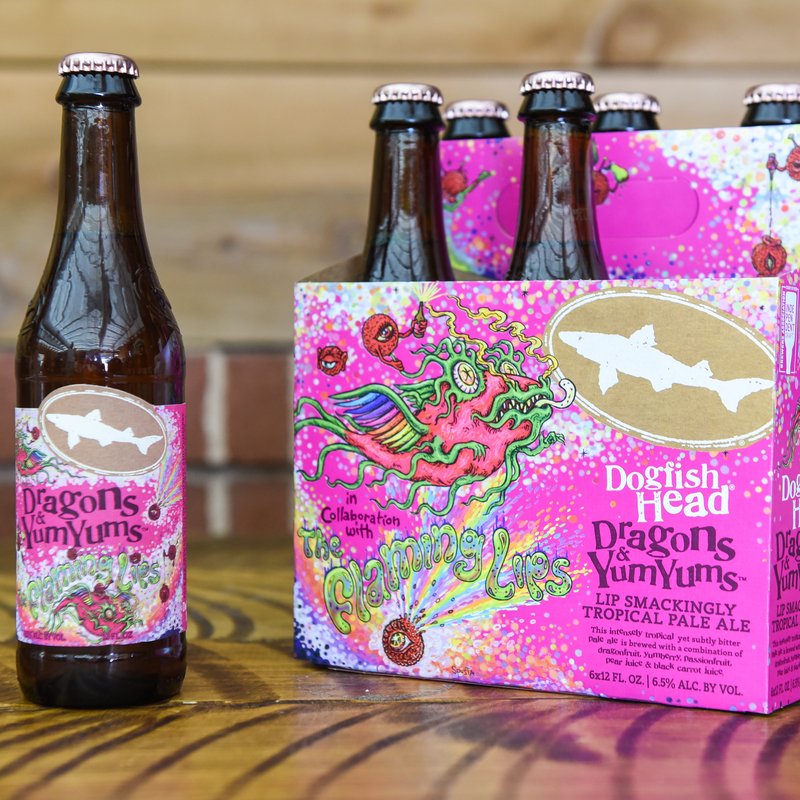 Hitting retail shelves and taps from late March through August and packing an explosion of fruit in every sip, Dragons & YumYums is an intensely tropical, yet subtlety bitter ale brewed with a combination of dragonfruit, yumberry, passionfruit, pear juice and black carrot juice. Clocking in at 6.5% ABV, this light-bodied pale ale has a balanced sweetness, yet slightly resinous flavor, with piney aromas and a pink, blush-wine hue. The psychedelic influence of the label artwork, designed by Marq Spusta as part of our Off-Centered Art Series, was influenced by the legacy of the Flaming Lips and the culinary components in Dragons & YumYums shown through radiating lines, movement of fire, dancing lips, rainbows and bold pink colors. Wanna get in all this Record Store Day fun? Check out our slew of events happening nationwide or join us here in coastal Delaware! - Dragons & YumYums release at the brewery! - Dragons & YumYums release at Brewings & Eats! - Record Store Day Celebration at Chesapeake & Maine! - Record Store Day Celebration at Brewings & Eats! - Record Store Day Celebration at our Milton brewery! Full list of nationwide events available here. *Want to get your hands on one of those elusive beer-filled albums you’ve heard so much about? We’re hosting a slew of off-centered events around the country where we’re raffling off 30 of these one-of-a-kind albums! Check back on March 23 for a complete list on where exactly you can find one in your neck of the woods!